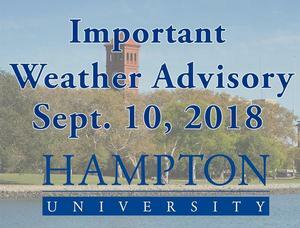 While it is still too soon to know what kind of an impact Hurricane Florence will have on the Hampton University community and Hampton Roads area, we are preparing for the safety and welfare of our students. You are advised to be prepared and careful. First, remain calm and follow the general instructions for students listed below. According to the National Weather Services and local meteorologists’ heavy rainfall across NC and southeast VA could result in flooding later this week. In light of Hurricane Florence, you are advised to be careful during the coming weekend. Beginning Thursday, periods of heavy rainfall and high winds are expected and on our campus this also means the low lying areas may experience flooding. Residents with cars in lot 32, behind Moton Hall; Lot 9 behind the Hampton University Museum; and on Indian Road in front of Holmes Hall should move their vehicles to higher ground parking areas in Lots 10, 11 and to the downtown Hampton parking garage in the Hampton University building. Be watchful when moving about during periods of high winds in order to avoid possible injury from flying debris. We recommend that you stay close to the campus and to your rooms as much as possible during inclement weather, especially since the periods for heavy rainfall and gusting winds may vary. The predicted amount of total rainfall in the next seven days is between 10 and 15 inches. Most of which will occur Thursday and throughout the weekend. All students living off campus are advised to follow the shelter in place plan set by the City of Hampton and if advised to evacuate, should do so to the respective sites in the City. Students who reside on campus should follow the shelter in place plan set by the University. If necessary, students will be transported by bus to Holland Hall and the Student Center Ballroom. Residence hall directors will provide residents with specific instructions. If you choose NOT to remain on campus, please go to https://secure.hamptonu.edu/dpae/ to complete the electronic form, notifying the University of your location. Keep your cellular telephones charged and be certain to carry your charger. Please make certain that you have a two week supply of your daily medications. This is especially important for conditions like high blood pressure, asthma, diabetes, depression and anxiety. While current forecasts predict a landfall well south of Hampton, there remains the possibility of a more northerly course and may have a direct effect on our region. Please continue to monitor nhc.gov or other official sources of weather information. All additional notifications will be posted on the University’s website, in the residence halls and emailed to your University issued email address. Be safe and make good decisions about your personal well being. -Know where your roommate is at all times or have information as to where he/she is going. If you are going to be away from the building, tell the Residence Hall staff where you may be located. If possible, leave a telephone number or cellular phone number where you may be reached. You should also go to https://secure.hamptonu.edu/dpae/ to officially notify the University of your location. - Information and all directives will be updated regularly with the Residence Hall Directors. Please follow their directives.